It opens with a grotesque crime: a teenage boy has gouged out the eyes of six horses. Child psychologist Martin Dysart (Jerry Hearn) is tasked with healing the boy… but also with finding the answer to a simple question. Why did he do it? Peter Shaffer’s award-winning play about love and worship thrills in a harrowing production by Canberra Repertory and director Barb Barnett. At core this play is a detective story: Dysart is the brilliant eccentric using all of his wit and guile to coax the truth from a hostile and sometimes equally wily culprit. As Dysart breaks down his teenage charge’s defences the truth slowly emerges… but the mystery only deepens. Jerry Hearn’s Dysart is restrained with a subtle but compelling performance – which means his moments of fire stand out even more. Benjamin Hardy is sullen and unyielding as horse-blinder Alan Strang, forcing Dysart to fight for every small victory. To say more about the story would spoil the mystery at the core of the play. Generally, I thought some of the nuance was lost in the relationship between Dysart and Strang. Strang is fiercely resistant right to the end and we never really see trust build between doctor and patient. However the cat and mouse games are engrossing and a brilliant script keeps the audience wondering how far into darkness the pair will venture. Benjamin Hardy also deserves praise for his bravery in taking on a role that exposes a lot of vulnerability. The pair are backed up by a strong supporting cast. Ian Croker and Nikki-Lynne Hunter are perfect as Strang’s parents, giving the right mix of love and potentially sinister qualities. We spend most of the play searching for the reason for Strang’s madness and pain and the richness of their performances gives us a lot to ponder, particularly in the lengthy first act. Jennifer Dansby, Rob de Fries and Alice Ferguson are all believable in smaller roles, helping create the sense of reality the play depends on. Equus is also famous for its chorus of actors playing horses. Cast all thoughts of panto from your mind – the horses are created with movement and stylised but striking costumes. The chorus is excellent with principal horse Graham August so believable that he comes close to stealing the show. While August gave a brilliant performance I wanted to see more from the rest of the chorus. They have their key moments but often they are just on standby. Barb Barnett has chosen to seat the entire cast on stage (strategically activating and deactivating performers) so the chorus is always visible. While the chorus is constantly alert to the action seeing them with their heads off removes a lot of their potential menace and mystery and diminishes their effectiveness. I was particularly impressed with Ian Croker’s set. Most of the action takes place within a simple square frame barely waist high. This cubicle-like space becomes an island of sanity with characters venturing out beyond it to visit the past or the realms of madness. Outside this space is the ruin of an ancient shrine. The message is clear: normality is a small space but outside it there is a vast and dreadful universe with powers that both torture and exalt. 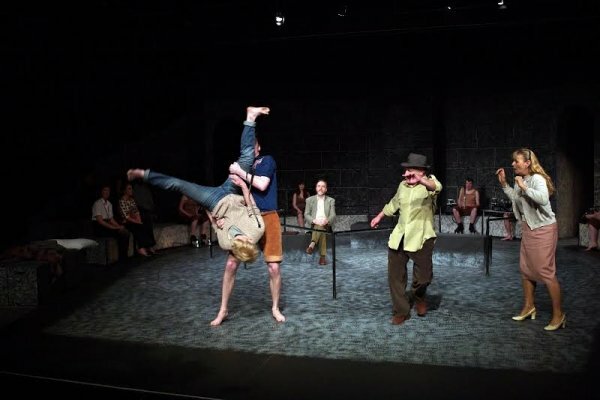 With the cast and some audience seated on stage (an unsuccessful attempt to recreate the experience of theatre in the round) Dysart must deliver his speeches in every direction, creating the feeling that he’s a medieval anatomist opening a body for students who peer down at him. A poorly designed set can hamper a show’s effectiveness so I was delighted to see a set that supported the show’s themes in a thoughtful but ultimately unobtrusive way. It’s not a show that is “enjoyed”, at least in the traditional sense of word. At interval the audience of the performance I saw was mainly shell-shocked: there was scattered applause as they tried to process what they’d just seen. And that was only the first act! Equus is a powerful play and Barb Barnett has sculpted a slow-paced but effective production. The script does most of the work (there were moments when I thought the action had become dangerously static) but the limited movement gives the play a ritualistic feel, as though we are participants in a solemn ceremony: Dysart as chief priest of normality taking a stone knife to the soul of his patient. To heal, yes – but also to kill the part of him that has been kissed by a rival God. The main criticism I have is that this production cleaves too closely to the safety of the original interpretation without breaking any new ground. But when the results are this good, why complain? A strongly recommended production – for those bold enough to take the bit between their teeth and be inaugurated into the secrets of Equus. When: 26 September to 11 October, 8pm.